ikat bag: I'm giving away a little bit of culture! So the drafting series is behind us - did you have fun? I hope you did! I also hope you learned something new, something different, something that freed you to think outside the box, something that might inspire you to try sewing from a different angle. And maybe offered you an alternative to buying (and storing) multitudes of commercial patterns, thus saving you lots of money and space. Why spend money/space on patterns when you can spend it on fabric? is my outlook on sewing, and life in general. This series was for me also a walk down memory lane and a revisit of my childhood. It is near impossible for me to think of drafting without remembering being a daughter, student and fashion brat in mum's house. That I also got to physically return to Singapore earlier in the year and resume drafting with the ladies who first taught me, was like icing on the cake. I only wish Grandma were still alive - what a party we would have had, could we (mum, Auntie Laura, Jen and me) have had her teach us! Now that would have been something to blog about. And then there's all of you - thank you for asking me about drafting in the first place. Thank you for your comments, your emails, your requests and your interest. Because of you, I got off my behind, thought of my own little girls learning to draft someday and said, "what the hey, drafting isn't easy to teach but I'll have a shot at it." What a thrill of a journey. And the best part was that Jen and I got to work together as if we were still in the same school (or even just the same country, dang), taking the same bus, hanging out in the same fast-food joints and coffee shops, dreaming of the day when we'd be all grown up and fabulously dressed. Which we are now, of course (fabulously dressed, I mean - I don't know anything about being grown-up). 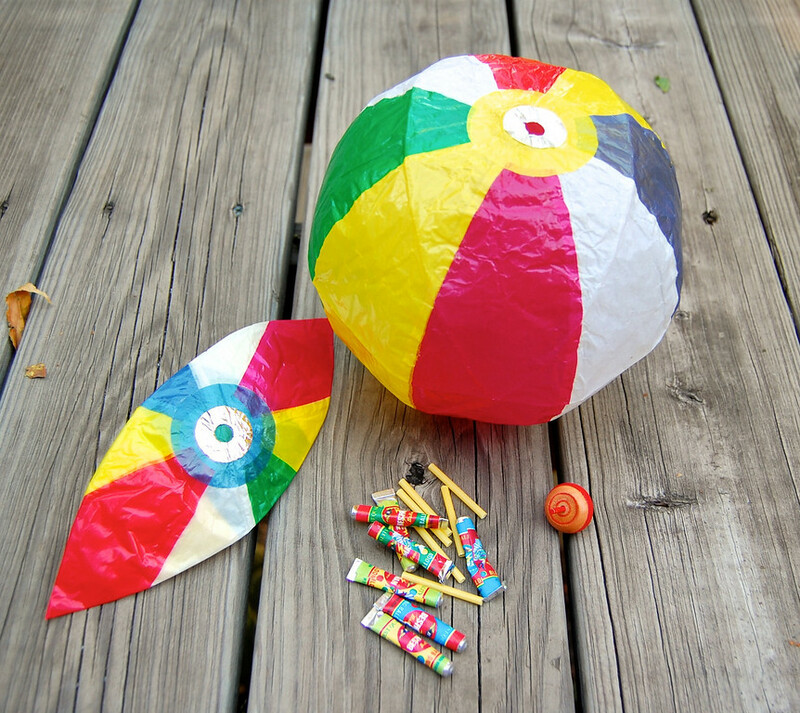 a paper ball, a little wooden top and some of those gummy bubbles inflated through a straw. (You're getting the folded ball, not the one I actually blew up with my germy mouth to take this picture). Some of the cute stationery that you can find in any part of Asia, really. 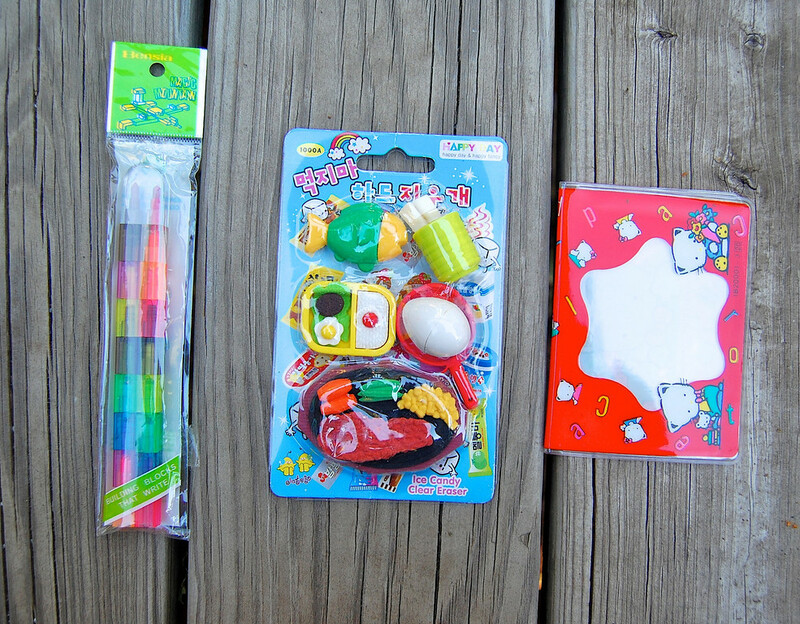 Here are a lego-style color pencil, take-apart food erasers and a card case - from Korea and China. 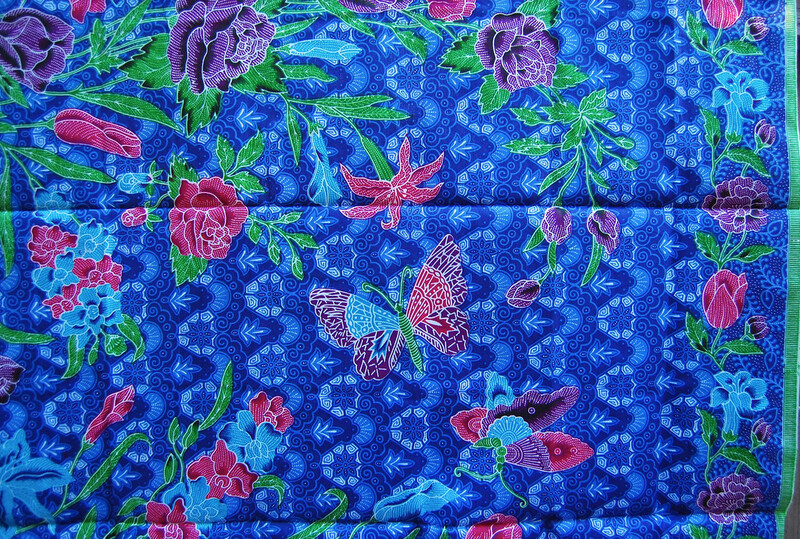 and batik. Of course batik. telling me one thing new /different you learned about sewing this year, and how you learned it/where you learned it - a book, a miserable personal experience, somebody's blog, a video, watching someone else do it, anything. Inspire me! Make me want to go buy that book, visit that blog, watch that video and avoid that miserable personal experience! with easy access to an email address. If your comment gets picked and I can't find your email address within ten seconds, I'm redrawing. I'm that lazy. Anyone in the world can enter, so start writing your stories now! I'll close the giveaway at midnight on Thursday and pick a comment at random and announce the winner the next day. I started out with a few blogs but the list grew from reading those blogs. I find all kinds of nifty patterns just by chance. I didn't used to buy them but I do now and have a lovely collection of tote bag and children's wear patterns that are unique and easy. Your blog is very inspiring to me and a great motivation to create and learn how to do what I want the way I want. I'm pretty sure that you have already mastered everything I have learned this year. My current project is making felt foods. They can be found all over the web and I usually see ideas and make up my own. I hope this was all to qualify me for the drawing. These items all look so lovely! I LOVE that batik! I learned to mind the fingers when sewing - especially when you are in a hurry! And that was learned, unfortunately, through a miserable personal experience! I was sewing my daughter's Halloween costume, looking at the fabric and not my finger placement, when suddenly the needle jammed. It actually took me a moment to figure out why it had jammed - it was stuck in my finger! I had managed to pierce the edge of my pointer finger with the needle. I had to remove the needle from the machine to get it out of my finger. Thankfully, there was only a little blood and the fabric was red and the pain was minimal. So, mind your fingers! Can't we just convince you to become a fabric and notions importer! And to publish your work? I want that cloth. I can taste it! 1) If my daughters (ages 13 and 9) are to be able to sewing projects, I have to make the projects small and absolutely fail-safe. Their current 'project' is to ornament white wash cloths that I bought at Walmart. In this project, they can't make a mistake. It's just impossible. If the ornamentation is in the woven stripe near one edge of the cloth, the cloth becomes a face cloth, and is identifiable as such. The kids can do any amount of sewing at any time [no preparation required] using either of my sewing machines, any color thread, any stitch they choose! This is perfect for beginners with short attention spans! And they've gotten to the point, both of them, that they can sew a straight line when they want to. 2) My husband says that our household runs on fabric. Say it ain't so! Even the kids have gotten into the act now. There is a recycled craft store near us. Occasionally I give them some money (like $3 or $4) and let them choose their cloth! Such happy kids! They don't have to do anything with the cloth, but they know they can do anything they want with it... and that they cannot touch 'my' cloth! 3) I need a sloper for myself and one for my 4'6" perfect miniature woman = my 13 year old daughter... Got to get down to it and make those slopers! I'm short, have a large bust, am short-waisted, my waist is also 'undefined', and I require a very long back crotch seam on pants. It's very hard to buy clothing off the rack! And this fall, our older daughter joined me in the short-curvy camp! 4) Teaching a motivated 30 year-old (smart, organized, passionate) to sew has been a great joy. I took what she thought would be a ten minute job and turned it into a multi-month project, in the course of which she learned a lot (including patience). She marveled at the ergonomic arrangements that I have for working. Her favorite was that I set up the ironing board so that both she, a leftie, and I could use it with the flat end at our preferred hand, with a table there to hold tools, no less! While we are not done yet, she has fledged and is sewing on her own, having great fun! 4) I learned how very like a squirrel I am. When the kids needed to do the bedroom shuffle (because now one of them is a teen! ), I was forced to move from my sewing aerie at the top landing of the front stairs to the basement. I thought I would hate that, but it has turned out well. Cool in summer, quiet, has a door I can lock! The funniest thing, though, is that I kept going into small spaces 2 floors up from the basement and finding MORE SEWING STUFF! I had it stashed any place there was 6 inches of space. Rolls of pattern-making material and cutting mats were between the piano and the wall. Utility fabric was in large plastic boxes in the box room, where I had to crawl around on my hands and knees to reach it. Large boxes of folded fabric were in my study, now a kid’s bedroom. Garment fabric was hanging in a closet in the upstairs hall. And on and on. It took me months to get most of it to the basement. There are still a couple of caches waiting to be retrieved. But probably the best thing I learned this year, I learned from you: Just go DO IT! SEW! and PLAY! This is the year I really started to learn to make clothing. Now that I have two little girls, it was high time to learn how to make a ruffle. Who knew it was really so easy?! What a fun pack of goodies! One of the things I learned this year was the great versatility of the Topstich needle. I know that Superior Threads and Leah Day, both, talk about it. I am a total convert. I use so many different kinds of threads and this needle seems to work with all of them! I made my sister's wedding dress this year and the main thing I learned was: never sew a wedding dress for someone you know and love! I also learned about underlining (with silk organza)-- the whys and wherefores, the benefits of understitching, and how to install an invisible zipper. Oh, and how much a woman's cycle can change her body size/shape in the matter of a week or two. Sheesh! In other crafting news, we made cardboard cookies like yours last night -- a big hit with my four year old! I finally used my blind hem presser foot and that has given me courage to try some of the other presser feet that I know will take my sewing to the next level! This year I have learned to make wearable clothes for myself and my children, which is a huge accomplishment! I love that fabric, it would make such a stunning dress! I learned how to sew a quilt block this year. I was asked to sew it for a young friend's "friendship wedding quilt". I did some internet research to get the basics (and it helped that I was sent the fabric already pre-cut :) ). I enjoyed it, but I'm not sure if more quilting is in my future or not. Hi Lorraine, I can't express enough all the wonderful things I learned from your blog. To start with, let me tell you this. I have never sewed anything serious, no exprerience with crocheting, knitting, quilting what so ever. Yes, I must have fixed a few buttons in the last 30 years. but thats about it. Then all of a sudden I had this urge to sew (long story) and I started looking up for helpful blogs. I tried many websites including the pattern for the itty bitty dress from another blog. Nothing came out right, I am pretty sure it was 100% me and had nothing to do with the pattern. Then I stumbled upon your blog and started reading from your very first post. I also downloaded and printed the Winter Jumper II pattern. I made it and it turned out wonderful. It must be the simple directions you'd on that hand drawn pattern or the beauty of the teal jumper you made. Don't know what. But it clicked. I would have returned my machine, if I didnt have that success in creating. I just had to show the dresses I made to the world and I even started a blog with the inspiration I received from the success of that dress. After that I made many dresses out of that pattern with twists. Usually people start learning to sew with Totes and such. I just had to make things for my kids. That inspires me, the pure pleasure of making things for them. I am also amazed at the things that you do for your daughters. They are 3 very lucky girls. I bought the book Happy Gloves and attempted to sew some stuffies from gloves. My first one was a disaster, but it inspired me to get crafty again, which I really enjoyed. I have a baby daughter and cannot wait to do some cool sewing and crafty things with her when she's older. You're blog is an inspiration! Oh, and I am absolutely obsessed with Asian stationery. Nothing cuter! meimihartmanatgmaildotcom. oh goodness, i've learned a ton this past year, mostly how to make my own patterns based on store-bought clothing for my 4 year old. and that was mostly trial and error, lol! I wish I had a better answer, but the best thing I have learnt this year is to make a sloper right from your blog. It has improved my sewing immensly. Thanks once more! It is kind of a silly thing, but I have learned that I don't actually learn something unless I go and TRY it. 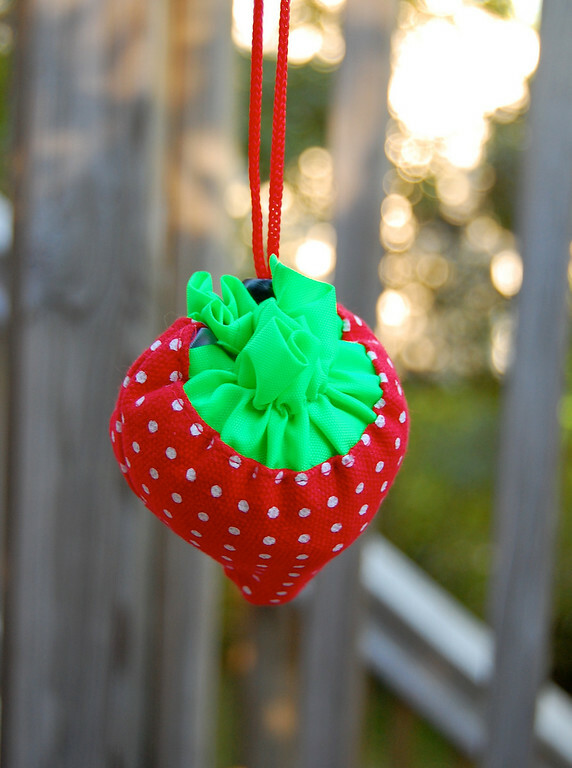 I am a scaredy-cat for some reason, and I have learned that making little zipper bags is not hard and if I've sewn ball gowns for myself, I can sew a little zipper bag. (Research for zipper bags was done on various blogs and in Lisa Lam's new Bag Making Bible book) I am intending to (very soon) take a step of faith and open an Etsy shop to sell crafty things, which I'm sure will be a whole new learning experience-- a very different side of sewing and crafting. p.s. wow, what a prize! I've really started reading the craft blogosphere this year, and I've learned a lot of things. But the lesson I've really learned this year comes from watching a friend start an online business selling toddler clothes. He's an artist, new to sewing, and loves design and his daughter, and he's very sweet. I totally support him sewing and selling! But watching him do it taught me that I don't want to. He has spent a huge amount of time setting up his business, buying goods, making samples: there's no way I want to do that. There's no way I'd break even with the childcare costs. Also I could never sell something with unfinished seams. Ever. *Shudder* So I've learned that I'm happy making stuff for my house and my kid and my friends and that's OK. Hooray for personal revelations! Oh my word, that is a bag of goodies! You are so generous. I have learned that the hardest thing is to just get started. Once I've started the rest is easy and fun, even when I have to undo 4 or 5 times. I follow a lot of crafting blogs, and yours was actually the first. Something I learned recently was how to sew a zipper. Of course there's a load of information on the internet and that is my primary source right now. I learned the amazing art of Elastic Thread. Never before heard about it until 3 months ago. I have made 3 skirts for my girls and have many more projects to use it. Amazing stuff!!!! what i learned about sewing this year? that a regularly cleand (with a fresh needle) sewing machine is a happy machine. you've also inspired me to try some of the projects you've posted. currently, i'm making a robot that eats cars and has a pocket on its belly to retreive them. again, THANK YOU sew VERY MUCH!!! 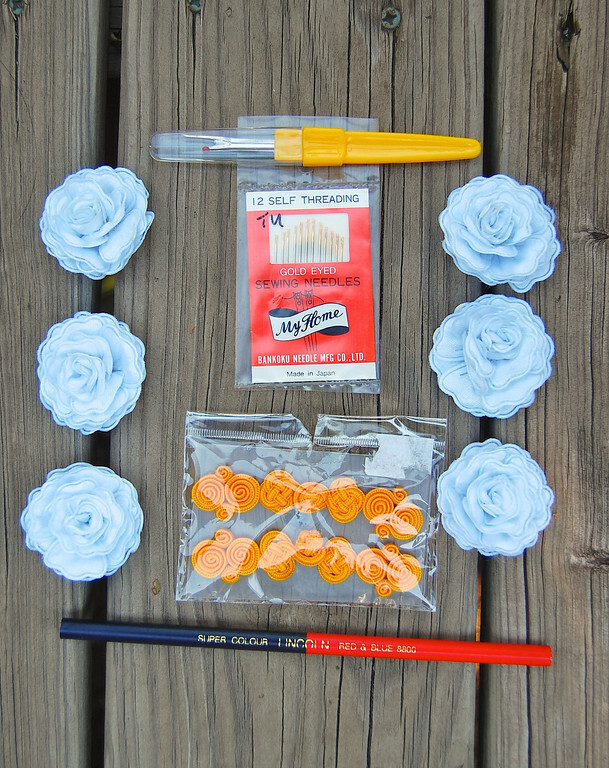 That great entry about the uses for a seam ripper on your blog! Who knew such a humble little tool could come out from the shadows and shine? Love it, love it, love it. Hi! I discovered your blog while searching for ideas of things to make for my girls for Christmas last year! I LOVED the costume box!!! The most useful thing I learned this year was how to successfully gather knits using clear elastic tape. I learned this (and every other beyond-basic technique I know!) from Ottobre Design Magazine and the Ottobre English Sewing Group on Yahoo! Things I've learnt: hats are harder than you'd expect to make smaller once you've sewn it all together - it requires some miracles of bias tape, elastic, and some sort of engineering. The other important thing I've discovered is that my daughter has a really long torso - and therefore to measure and alter shop bought patterns. It wasn't my sewing skills that were letting us down, while she is standard height and waist measurements, the long torso meant that pants were always way too long and shirts not long enough. How to hem a gored skirt. Researched a lot with Google and talked to a sewing friend. Ended up loosely gathering the hem before turning it over and sewing, not the only solution but the one I went with. Looked great after a good press. Oh yes, pressing vs. ironing was something else I learned! I think it was at the Selfish Seamstress blog via a link here. This year I learned to keep my seam ripper handy at all times. And that meandering quilting is much, much harder than it looks!! I stumbled across sewing blogs this year. I can't believe I never knew about them before but I am hooked. I have 4 including yours saved in my favorites that I check several times a day. My list of to do projects has tripled but I am really enjoying all the community has to offer and everything I have made from tutorials etc has been so easy and fun to make! In addition to learning new ways to use a seam ripper (my favorite being to poke fabric under the foot of my machine -- thank you! ), the other valuable lesson I (re) learned this year, is to check/measure twice before cutting! (yikes!) -- and of course, I had to relearn this lesson in front of a friend that I was "teaching" to sew a tote bag -- very embarrassing! I am learning so many things this year - really simple stuff but mostly how to finish off projects like adding binding and finished edges. I'm also trying out some different items for the kiddos, we'll see how that goes. I love your blog and your great ideas for kid crafts! Thanks for the chance to have some South East Asian goodness! What have I learnt in the past year? I became a first time mom (still a learning experience! lol) and decided that I wanted to learn how to sew and be able to make my daughter great things. 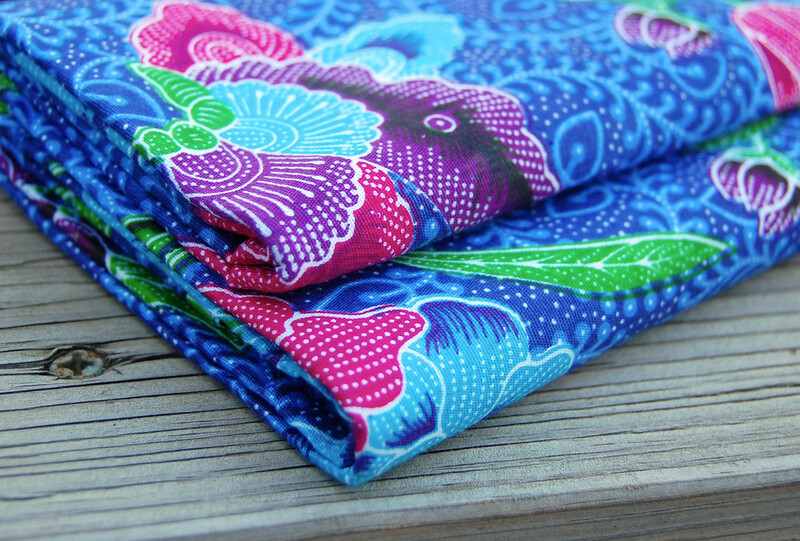 With a new sewing machine and time to drool over wonderful blogs (like yours! ), I realized that my creations may not be perfect, but I hope that someday, my daughter will be proud of what her mom made. Your giveaway is wonderful, good luck to everyone! I learned the hard way - don't stockpile fabrics for your child based on their favorite color! Buy and use as you go - otherwise, you end up with yards of fabric in a color that now makes your kid want to cry. On a completely separate note, anyone need about a billion yards of purple fabric in varying hues and styles? I absolutely love your blog and am truely inspired by the drafting series you have created. I cant wait for my daughter to get a little bigger (6 months) so I can draft my own patterns for her as they are so expensive to make. My Mum drafted patterns for me and my sister and brothers but she just did it by eye and experiance. One of the many things I learn't this year is a little embarrassing to admit but it's tieing a knot in thread for handsewing. It was on youtube and the video was makink a french knot but the thing that caught my attention was how she tied a knot in the end of her thread. It was making 2 loops in the thread and passing the needle thru it. So much easier than the way I use to do it and it makes a good size knot. I cannot tell you how many wasted minutes I have spent turning spaghetti straps or other small tubes. I've bought tools to make the process easier (and still struggled). But then I read that blog entry and realized how easy it could have been. Seriously, I can't believe how easy it is. That's the big "zing" link for me. But as I have been following more sewing blogs, I have been learning to trust myself more and take more chances. When I read about your visit home and taking lessons in drafting, I realized that the best sewists are perpetual students. So I pore over new ideas and techniques and decide which ones I want to try. But most importantly, I try. This year I've learned to mix and match parts of patterns and take the leap to create in my head, then paper, and finally to just go for it, tweeking if necessary to get to the final product. It's been fun, and my daughter now has a princess costume that she loves. This is soooo difficult - the most I learned was from you, this drafting series! But if you count embroidery in, I loved discovering the hand embroidery tutorials by Sarah - http://www.embroidery.rocksea.org/ Such clear instructions, and stitches sorted out by families. Its just wonderful. As to contacting me, its even easier than email - www.contactify.com/383df Just fill the form on this page and one click! Last August I casually typed in how to sew on the computer and my life has been in a whirl wind ever since. I follow several sewing/crafting blogs and love the tutorials. Honestly, I would have been sewing years ago if I had had someone show me how. I have learned it's okay to make mistakes, most can be fixed. It's great to follow a pattern or instructions but it's also okay to try things your own way. Thanks for the giveaway. I made a necktie this year! I had a gangster outfit for Halloween this year, and purchased a $50 costume for $10 because it was missing the tie. I watched this awesome Threadbanger video (http://www.youtube.com/watch?v=_jHZo_UK2bs) and this cool other video (http://www.youtube.com/watch?v=yjPKcfBt5-g) explaining how to make a tie and it worked out great! The awesomest part is making the tip - I usually like to think I have good spatial intelligence but when it came to making the tip I just followed Threadbanger's instructions blindly and it worked... black magic I tell you! I have learnt two things- the hard way!First- Buy enough thread to finish a project- the mei-tai I sewed for my daughter to carry my grand-daughter in has three different shades of thread! But it doesn't show too bad! Second- Don't forget to check your tension, especially when sewing multiple thicknesses, lots of unpicking if you don't- I know(that's why I need a big stitch ripper!) Oh and the third is- I must get an overlocker!! Shame no one gives those away! 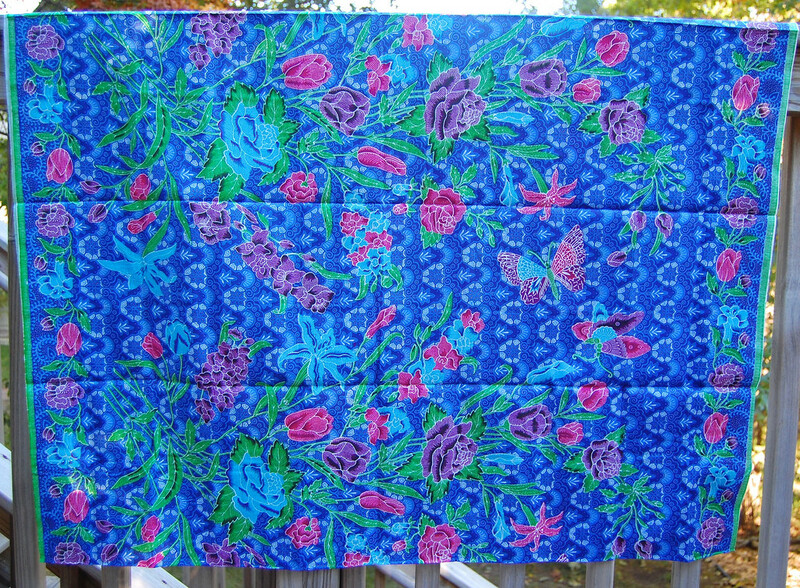 !Seriously though I love the Batik, such a great colour! Thanks for being so generous. I have prepared some pants (one based on your tutorial fold-up cuff pants) and skirts, and a wonderful winter hat from fleece based on a tutorial I found at "from an igloo". Oh how I would like to receive this package! The most useful thing I learned this year is that you REALLY should wash your fabric before starting a project! Now, I just wash everything... even if I don’t use it right away. I also learned how to use my serger machine and I love it!!! Couldn't do without anymore! I started sewing almost a year ago and I think the most important thing I learnt is the importance of pressing! I used to hate ironing and only used my iron when I had to. What a difference pressing makes when you are sewing something! I've read it everywhere... I just had to try it myself to see the difference. I also learned to read the comments on blogs, because I learn from the comments, too. I never even knew what a sloper was until I read this blog! I've been experimenting slowly with this and it is starting to all come together! Great giveaway! I learned to leave extra seam allowance if I am doing french seams. Although I'm a total beginner, I decided to sew my 3-year old daughter a simple silk summer dress (a nice cool fabric), just two pieces and straps and throw it together, right? Well, at some point I saw the word "french seams" on the internet and just had to experiment with them on this, my first dress ever. The seams are gorgeous, but they took up so much fabric that the dress does not fit my daughter at all. Grr! Luckily, I gave birth to another daughter in July, so she'll be wearing those darn french seams some day. I finally learned how to sew little tiny clothes this year, thanks to having a new baby. I've never had the patience for doll clothes, etc. because of the fiddly seams and tight curves. Because I HAD to have cute baby clothes, I got over my issues with the help of Anna Maria Horner's book and Amy Butler's Little Stitches. Now I love the tiny clothes - they're so quick and satisfying and cute! I also learned how to use a zipper foot and a buttonholer. Now I have to tackle the ruffler foot on my vintage Singer. Hopefully this weekend! I learned a lot from your blog! Plus I learned to make a tiered skirt using this tute http://www.theanticraft.com/archive/imbolc07/petticoat.htm. What I HAVEN'T figured out is how to adjust the ruffler attachment on my machine to make it EXACTLY ruffle the length of my fabric in half so I can make then super fast! Maybe you know how? My most rewarding sewing discovery this year was learning some beautiful hand embroidery stitches. I had always been convinced that I was too impatient to pick up these and relied on my sewing machine. Recently though I discovered "Sarah's Hand Emrboidery Tutorials" online. I saw lots of impressive stitches I had never even heard about before, presented clearly and described concisely. I picked up an embroidery needle and soon afterwards completed a whipped back stitch. 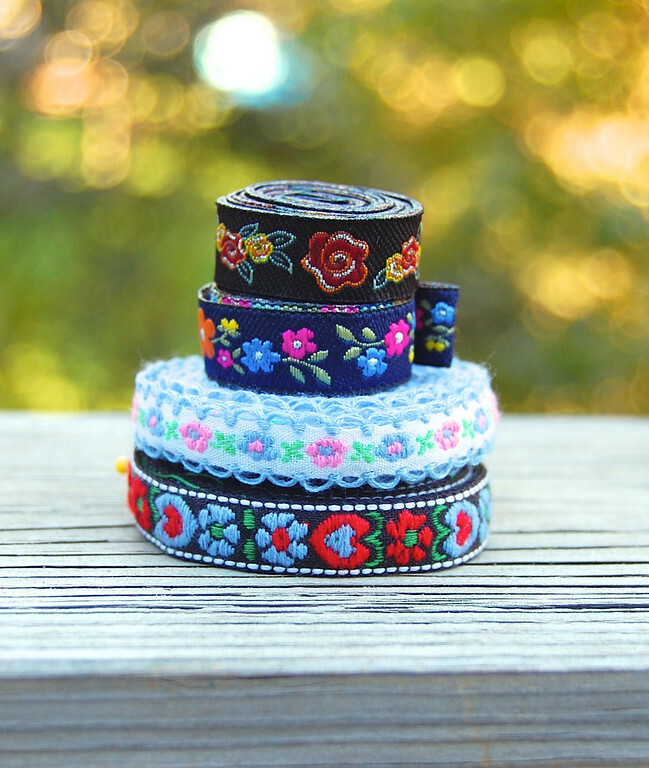 I learned how to make the pieces of my hat line up - thanks to you!!! And then, I realized that you already taught me that once, when you sent me that cute ball kit. I've made at least three of those little balls, but somehow never connected the process over to making a hat. Very, very silly of me. I've also learned that fabric and thread quality makes a HUGE difference. And that I want a nicer sewing machine, but I'll probably wait a while for that one yet. Maybe I can teach Emma to sew, and then she can have my current one and I can get a nicer one? What a super package! Thanks for the giveaway! I've always loved those paper balls. What a great thing to store in the must-be-able-to-amuse-small-child-at-a-moment's-notice section of my purse. I've learned a lot from blogs this year (Ikat Bag, Sew Mama Sew, MADE, and others), but I think that the most valuable lesson has been to rip back a mistake right away. There's no shame in taking something out to re-do it (especially if you've been working without a pattern, or trying something new) and it's much easier to take it out right away, even if you have to take some time away from the project before you come back to fix it. What I have learned (from you)is that I have been wasting precious time. Now, every spare moment if filled with sewing, playing with cardboard (great stuff! 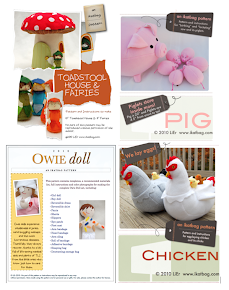 ), and making felt food and softies. My grandkids love it all and think I'm super. Thanks for the wake up call. I admire and appreciate all you do. I hope I win. I have learned SO much. Just one thing? I'll do the most recent: I learned how to make a mummy costume from an old sheet, and in so doing, I learned how to rip even fabric pieces for making the costume (my children learned that they could tie things up with the extra pieces! So my husband made sure they found their way to the trash two days ago :)). I've done a lot with sheets this year, and I've got more planned for Christmas presents (you can see a close-up of the pink nightgown I made in my interview here). email: brandy at The Prudent Homemaker .com (take out the spaces, etc). I learned that you don't have to buy expensive patterns to sew lovely things. There are a lot of great blogs that have tutorials for how to sew things, and I love the generosity of people that share their inspirations and ideas with the rest of the world. I learned that my children are happy to have their dinner on the lounge room floor on a spread out tablecloth and call it a picnic - which is handy as the dining table has been turned into Sewing Central for the last few months. I learned that a timer with an alarum is an excellent thing as I sew while waiting for the dinner to cook - and 'just one more seam' leads to another and another, until the skirt is finished but the dessert is burnt. I learned that the best place for the ironing board is handily right next to the sewing machine - which frees up more space in the laundry room for the mountains of washing that are piling up and ignored as I'm too busy sewing new stuff. And I learned that it takes one big pot of tea, two temper tantrums andd three hours to make friends with your new serger. But it is worth every minute. I learned how to make a reversible jacket - Uptown Girl - for my three year old daughter - I followed the pattern faithfully even though I could not see how on earth the two wrong sides sewn together were going to emerge right sides, until... I got to the part where the whole jacket had to pulled out through a sleeve! How cool. And it worked. And it looks fantastic! Your blog is a true treasure! Well done. I had my mom give me her 50 yr old Singer sewing machine in the hopes that I would teach myself and my 7 year old how to sew. This machine could not be more easy--no bells and whistles like modern machines and yet I cannot even master the basics. Every time I come near it, I break it, mess it up, or otherwise fail to get it going. I have learned this year that hand-sewing is a great, no-stress way to sew. hahah i learned a lot of things about sewing this year through the sewing class that i took (but actually got on accident) in my freshmen year of high school (i'm a sophmore right now). i love your blog by the way, and your kids are so cute! haha i wish my mom could have been like you when i was a kid. Having one child and studying for a second degree I often find myself using just every spare minute of the day for sewing. Can you imagine I even have the machine in the kitchen so I can run a few stitches while cooking! Now serious, I have learned to be confident. To try out my own ideas and they tuned out really nice. To use different fabrics, techniques and just see what happens. One of my favourite site is farbenmix.de. My daughter also loves the color combinations and their ribbon collection. Oh please let me know where you do your shopping in Bangkok. I always get lost there! I finally jumped in with both feet and started sewing clothes for my kids. I really liked how to attach the shirt collar on scientific seamstress's bowling shirt and have since used it again in other patterns. I love her instructions in her blog on how to adapt patterns to make princess dresses, and I plan on getting some princess doll dresses done by Christmas (her patterns come with a doll pattern that matches). I learned how to sew stretch fabrics. All of my sewing mentors told me how hard it was and how everything would pucker... I found some cute knit fabric, a free skirt pattern, and VOILA, the best, most flattering, item of clothing I've made yet! Just go slow and steady, with a ballpoint needle. Best of all, it's for me, not my daughter. I wear it around town and at work and always get compliments on it. I learned that sometimes it is okay to put away a project that is not inspiring me. I can come back later and finish it, or repurpose it for another craft. *I've been inspired by blogs such as yours and icewerks.blogspot.com. *I've been encourage by joining sew alongs such as elsie marley's kids clothing week. *I'm longing to try my hand at some hand sewing while I repeatedly flip through the pages of the Alabama Stitch Book. This is a simple thing, but this year I learned I could make crib sheets. Why I did not think of this a few years ago when I was lamenting the boring/blah choices in the stores, I do not know. However, now I have several colorful and fun sheets that were 1. inexpensive to make, and 2. FAST. Another thing I learned this year is that the smaller and faster the project, the more likely it is to be finished. I have three small children and one of them is a newborn. I don't have a lot of time/energy to sew, but I LOVE to sew. To get any kind of "sewing satisfaction" I have learned to stick to the projects I can finish in a few short sewing sessions. I like your blog and I appreciate all of the helpful hints you share. I would never have thought to make halloween princess costumes using fleece! AWESOME! I've got some ideas now for next year. Thank you a ton! I just learned to put in zippers. As in really put in zippers... centered, lapped, mock fly, and invisible. And I can do any of them without having to read the pattern instructions. I'm so excited... my pattern possibilities have now expanded considerable. It's all thanks to a wonderful sewing instructor at Vogue Fabrics. I sew love your blog!! The next item on my list of things to learn is a bit of quilting! One new thing I learnt this year was from which end of the thread to thread the needle, and where to put the knot on the thread when sewing by hand :))). I was always doing it the wrong way, therefore my thread would always tangle and knot and... pfff :) That never stoped me from sewing, I did beautifull needlepoit paintings, embroidery and many other items, always cursing and getting tensed because of the damn! thread that would keep on knotting and tangle! Luckily, gods had mercy on me: this year, from internet, I think from a blog, I think this one http://crazymomquilts.blogspot.com/, I have learnd which end of the thread has to be put into the needle, and be knotted. The beginning end that is, not the one that you just cut. :D I guess it is common knowledge, and it has to do with the twirling sense of the thread. Now it works like a charm, and I never had trouble again. And about that blog, in case you don't know it, I can tell you that, for me, is your equivalent, in quilting. She does quilts. Oh my God, sooo beautifull!!!! and simple. Not the show type quilts, quilts that you design and engineer for years just to get one ribbon at one show, the mother of all perfections, oh no! She does the down-to-earth, warm, soft quilts, with simple techniques that even a child can put together, quilts made for living with, cuddle under, be comfortable on, just for fun or fo rhelp or for something basic like that. For that, I keep going back to her, as I keep coming back to you. Thank you for all your efforts, for your organised mind, for thinking things over and most of all for your willingness to share. I only started sewing this April, so everything I've done has been new! I think my favorite thing was how to install an invisible zipper. The cheap plastic variety was the only foot of this sort available at my local sewing spot, but the tutorial here http://coatsandclarksewingsecrets.blogspot.com/2009/08/invisible-zipper-foot.html shows exactly how to use the jumble of bits in the box. 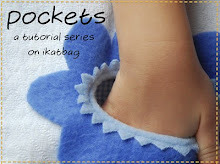 There's also a lovely video tutorial on Grosgrain's blog for using the foot itself that make these easier than putting in regular zippers - hooray! I learned how to install an invisible zipper in a skirt at a Skirting Couture class with Anna Maria Horner. It was such a wonderful class, and it was REALLY helpful to watch her and her assistant sew in the zipper in front of us. It makes so much more sense than the patterns do! I also am SOOO excited about your drafting series and am planning to re-read it and study it very carefully. I've been wanting to learn drafting for so long but couldn't afford to audit a class at our local design school. So THANK YOU SO MUCH! I've learned not to be afraid. I;ve always bought comercial patterns and they never seem to fit me- too bigg, too loose, too tight etc... but I was thought I needed professional classes or something to learn how to make something that really fit me well. But now I have the faith that I can make my own clothing that fits well and looks beautiful and doesn't have to cost a fortune and there is the joy in knowing that I made it myself! Plus how could I not feel a kinship with someone who loves and appreciates their seam ripper as much as I do!